Why? Simply because there are a number of angles and routes we could take to determine the final verdict. Those different routes would end up giving extremely different verdicts and so it is from this point of the review that we have to pick our destination carefully. To get straight to the point: this game is very, very fun. On saying that, this game also has a lot of flaws that could have detracted from the entire experience. Thankfully for Nintendo these flaws don’t really take any of the fun away, allowing for the negatives to be somewhat brushed beneath the carpet. 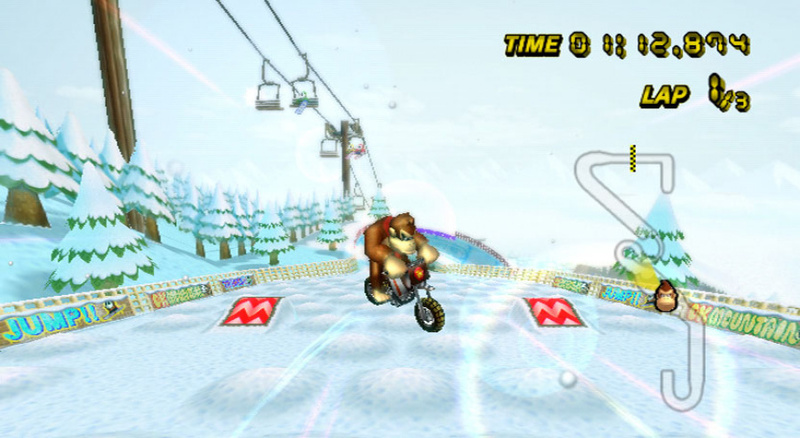 Mario Kart Wii is essentially Mario Kart DS blown-up and built upon. Mario Kart DS was probably the best game in the series and so this is a big accolade for Mario Kart Wii to earn. The way the game handles is far superior to Mario Kart 64 (which hasn’t aged well) and it also runs a lot faster than the dire Double Dash!! This is a proper game of Mario Kart and the extra four characters per race (12 characters instead of the original 8) only add to the kind of mayhem that we’ve all come to expect from the series. 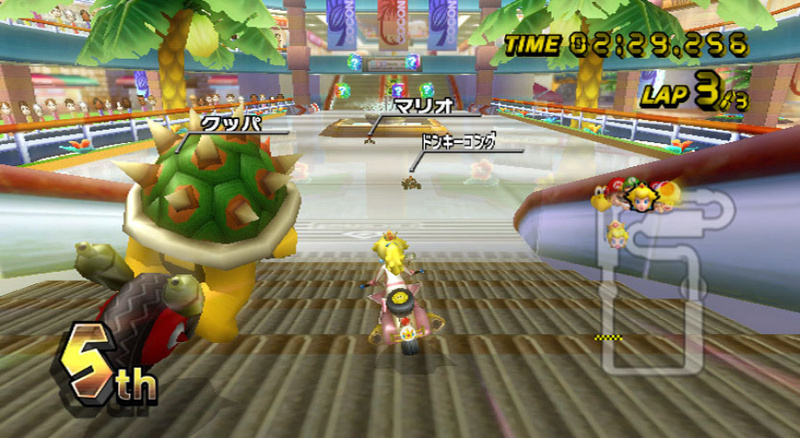 The game comes packaged with the traditional single-player mode, a multiplayer mode (up to four players on one Wii console), the Nintendo Wi-Fi Connection mode (I’ll go into detail later) and the Mario Kart Channel. The single player mode is typical affair with the Grand Prix mode, Time Trial mode and Battle Mode present. As usual the Grand Prix mode is split into 50CC, 100CC and 150CC but there is an important twist here. 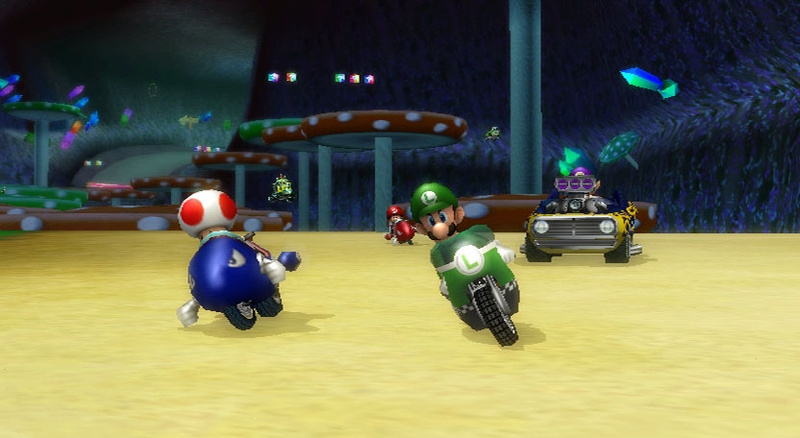 Bikes have been included to mix up the gameplay somewhat and although they handle slightly differently to the kart’s essentially they are the same. What is different about the bikes however is the ability to execute a “wheelie”, which allows for a temporary speed boost but a lack of control over the bikes direction. The bikes are questionable addition which has caused an imbalance in the dynamics of the gameplay. Sadly the karts just can’t compete with the bikes ability to execute speed boosts whenever necessary and so it means that anyone playing with a kart should get beaten by the bike. In the single player Grand Prix: only karts can be used in 50CC, only bikes can be used in 100CC and a mix can be selected from in 150CC. The Grand Prix mode is split up into 8 different cups providing 16 new tracks and 16 classic Mario Kart tracks. 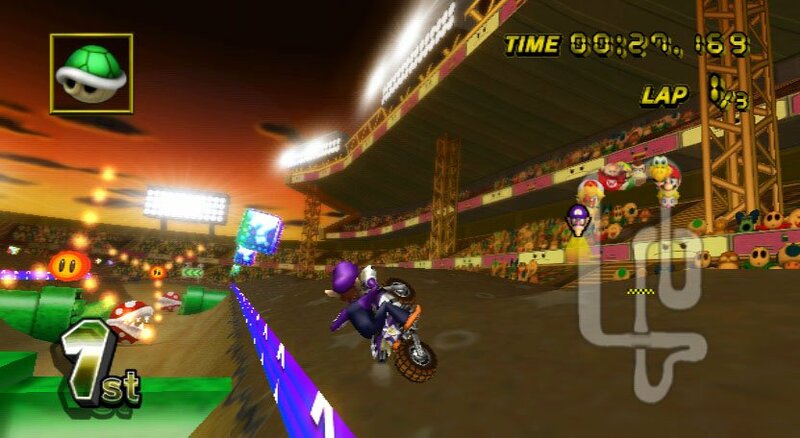 None of the new tracks are particularly memorable with the exception of Coconut Mall and Wario’s Gold Mine – both of which are really outstandingly thought out tracks and thoroughly enjoyable to race on. 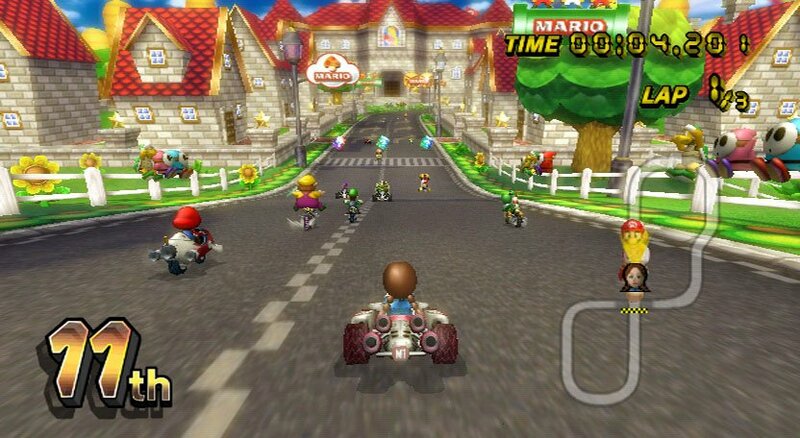 The other tracks are not bad, just they seem to lack the “Wow” factor that you experienced when you first found Peaches castle in Mario Kart 64 and also drove around Isle Delfino in the GameCube and DS versions. It would have been nice to see the inclusion of some environments from Super Mario Galaxy, Wario Ware or Super Paper Mario but sadly they are non-existent. 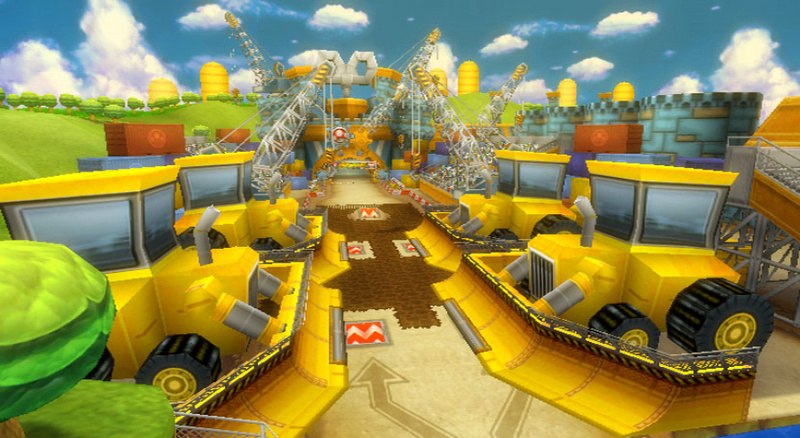 The tracks have all been designed with Mario Kart Wii’s other new big addition in mind: the trick mode. Tricks are basically simple moves which can be executed when your kart is mid-air, allowing you to gain a small speed boost when you land. Think Excite Truck and you’ll get the idea. This means that many of the new tracks have been designed with this new trick system in mind and therefore include more ramps and “half-pipes” than ever would have been present in previous versions of Mario Kart. Thankfully the tricks are really fun to pull off and are a welcome addition to the game. Sadly, when you’re driving around, pulling off tricks and having a nose around at the environments there is not a lot to see. We all know that the Wii is not the graphical power-house that the PS3 and the XBOX360 are but surely the console can deal with better visuals than this. Which brings us to our first real complaint about the game: it looks horrible. And I mean really horrible. 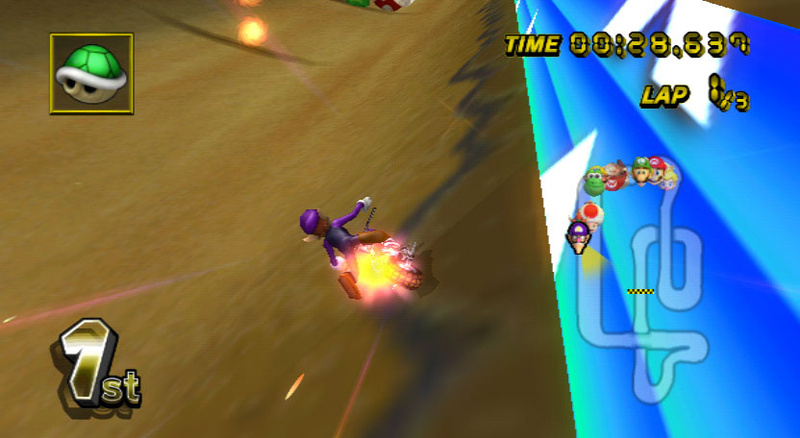 The environments are sparse and (with the exception of Wario’s Gold Mine) look extremely bland. There’s little to no background action (minus that of “paper” Mii characters) and everything just looks blurry. It’s almost like Nintendo tried to add a “sheen” to the game but ended up making it look even worse than it already was. Sure there are some nice effects like when the sun hits the lens of the camera and you get glare on the screen but such effects have been present since the days of the N64 and Mario Kart Wii lacks anything that makes it stand up next to a true next-gen game. Visually it looks like an early GameCube title if not worse. It’s apparent that little time has been spent designing the karts and bikes and adding anything of real value to the backdrop’s of the stages. There is one particular track where you go underwater and you can see huge eels swim around you, which is a nice touch but moments like these are few and far between. It’s not just the in-game graphics that look horrible though – it even comes down to the presentation of the menus; hell, even the “Press Start” screen is bland – providing just a white screen with a tired image of Mario and Luigi holding the Wii Wheel and the Mario Kart Wii logo. In times gone by Mario Kart games would always have an awesome graphic greeting you on the opening menu screen but not anymore. The menu screen looks cluttered and confusing (ironic considering Nintendo are trying to simplify gaming for everyone) and the text blurry and poorly rendered. And yes by the way, I am playing with Component Cables. Thankfully poor as the game looks it really doesn’t hurt the gameplay. I truly mean that too. The game runs at a very decent speed (in 150CC anyway) and there is no lag at all (online or offline). 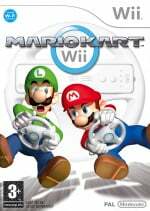 Lag would really hurt a game like Mario Kart which relies on precise accuracy around corners and also the ability to always have your opponents in close sight so maybe that is why Nintendo opted to produce solid, lag-free gameplay as opposed to pushing the Wii’s graphical capabilities. 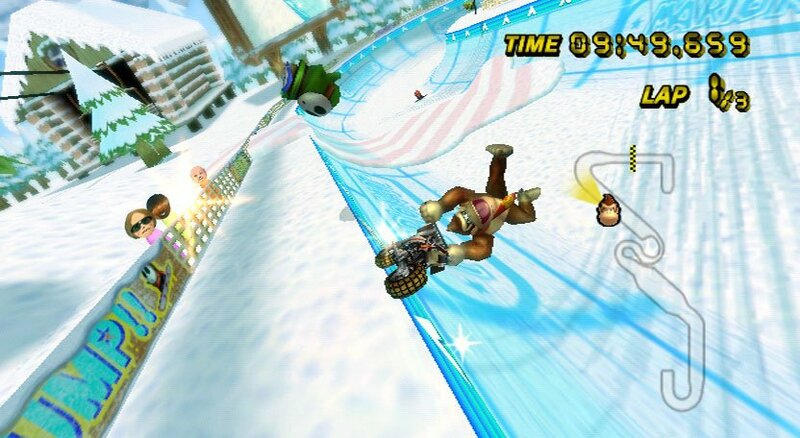 The thing with Mario Kart Wii is that poor as the game looks you will genuinely forgive it because it’s just so much fun. It’s classic, addictive, “one more go” gameplay and it works perfectly. The game still doesn’t feel dated or tired and the new features only extend the gameplay making it feel fresh and new. One of the problems with the Mario Kart has always been that it’s best enjoyed with other people. This has normally only been possible when you have friends around but Mario Kart Wii finally solves this problem. With Nintendo finally stepping into the new era of gaming and including online play; gamers can finally enjoy Mario Kart online. To sum up the Nintendo Wi-Fi connection simply: it’s superb. I mean: really superb. This is as good as any online game on the Playstation 3 and XBOX360 right now, if not better. In fact the only thing that detracts from the online experience are the obvious flaws in the hardware; the lack of a friends list, no easy to remember gamer tags or ID’s, lack of voice chat, friend codes, etc. Take these flaws away though and you have a seriously polished online experience. You choose whether you want to play worldwide or continental, you choose a character and vehicle and then (almost instantly) you’re added into a game. You’re first introduced to which gamers you’ll be racing against as their Mii does a little salute and tells you what part of the world they’re from and then that’s it. You’re in. You’re playing Mario Kart against people from across the world. It doesn’t lag. It doesn’t glitch. It just works. The ranking system is a little bit dodgy but works fairly well: every player starts out with 5000 points and you gain or lose these points depending on which place you finish in the race. I’d have preferred a win ratio rank myself but this does the job adequately. What’s so great about Mario Kart Wii online is once you’ve joined a room you’ll never have to leave it. Players will leave and new ones will instantly be put into the room to fill others places. There’s no hanging around either – there’s enough time to boil the kettle in between races but never will you be sitting wishing the next game would hurry up and start. It’s just consistent race after race after race. For as long as you want to play. You can quit after any race or just choose to keep playing. In a way the online mode is the antithesis of the graphics because it’s just been so well thought out and executed. It needs to be experienced to truly understand the extent to which the experience has been honed. In addition to racing online you can also take part in Battle Mode which comes in team based games of the traditional balloon popping game or another coin collecting mode. Battle Mode may not be everyone's cup of tea but the game comes packaged with loads of new Battle Mode stages to get to grips with, all of which are really well thought out. 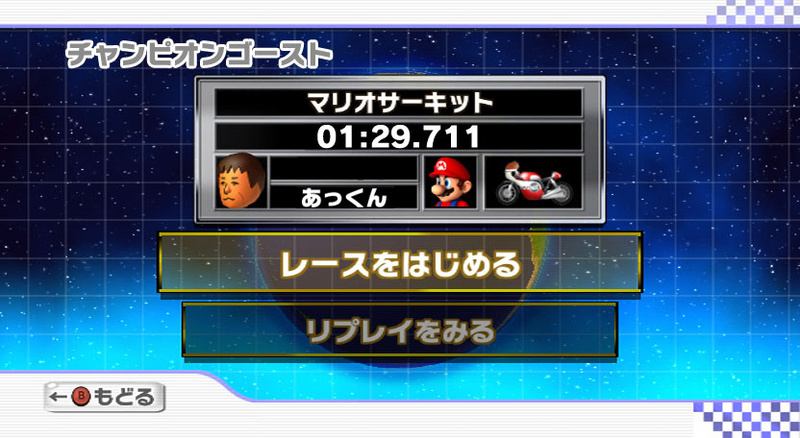 Finally included in the game is the Mario Kart Channel which allows you to view all the high scores from across the world and see how you compare. You can choose to race against the leaderboards top time or you can choose to race against the Nintendo development staff. Finally included is the ability to race against your “rival”. A rival will be a time that is just slightly better than your own best score and so racing against them gives you the incentive to keep improving your time. The Ghost Race mode is another new inclusion which is added into the Mario Kart Channel which basically pits you against a random ghost on a random track and tells you to beat it. This is an awesome way of setting loads of personal records on all the tracks which you can then use to improve at some point. The main things we have yet to mention in this review are the controls which we’ve purposely saved until last. Everyone should know by now that Mario Kart Wii comes packaged with the “Wii Wheel” – a peripheral which allows the Wii Remote to slot into giving full motion controls to the game. Does it work? Yes. Does it work well? Yes. Will you use it? Maybe. Basically the Wii Wheel is not what it has been dubbed. It is not a gimmicky, cheap, plastic add on. It is actually a very well thought out piece of kit. It feels durable and nice to hold, the Wii Remote slots in snugly and it really does make the game more fun to play. It will take some getting used to no doubt about it but it really is worth trying out as soon as you get the game. The sad thing about the Wii Wheel is that when using it you will unlikely beat anyone playing with a GameCube pad, simply because it just lacks those couple of seconds of accuracy that you will gain from using a traditional controller. If Nintendo would have locked the game to using just the Wii Wheel then it would get a lot more use than it is just now and given the quality of the thing it really does deserve it. Sadly if you want to compete for those high score times or online against the best you'll have to use a GameCube pad because all the best players already are. 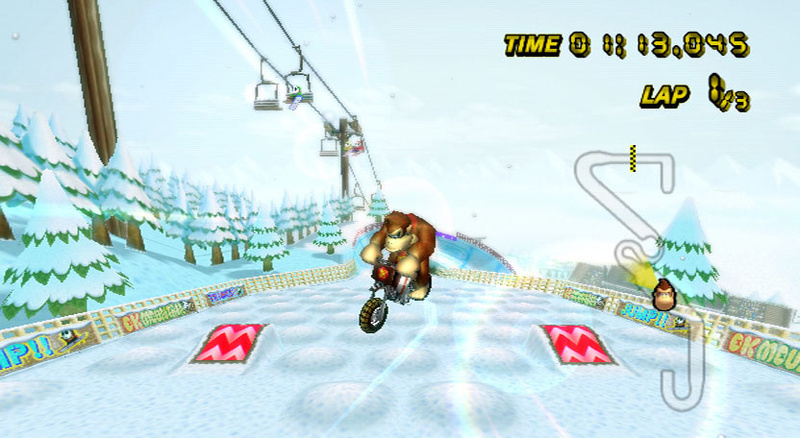 We recommend using the Wii Wheel in single player because it genuinely is fun and deserves getting some use but of course, the controller options are down to you. Mario Kart Wii is value for money (given the extraordinary amount of stuff on offer in this game) and is most importantly damn good fun. Sadly the game looks hideous and is poorly presented and put together. The menu screens and the visuals really make you think “rush job” but when you get into the online game you’ll be hard pushed to find a game on any console as well put together as this game is online. It is in that sense that Mario Kart Wii has been polished, has been well thought-out and is brilliant. Nintendo really need to get their arse together and start pushing the technology like they did with Super Mario Galaxy. Poor presentation should not be an issue in this generation of gaming, particularly with the other consoles doing it so well, but, thankfully for us (as Wii owners), this game is a living, breathing example of gameplay over graphics. I certainly agree that a person's reaction to the game hinges on how far they can overloook certain minor niggles and flaws. Sadly, I'm in the 'moderately frustrated' camp, and if pressed to give a score, it wouldn't be higher than 8/10. I was similarly disappointed with the lack of references to the post-Double Dash Mario properties. The Rainbow Road music is the only real track-based allusion to any of the games you mentioned. The Mega Mushroom was a good idea, but I don't think it added too much. Definitely agree that the main artwork was uninspired and over-exposed. We've been subjected to the Wii Wheel Mario and Luigi image since the game was formally announced. It wasn't a particularly compelling image to begin with. I found myself looking back at the Super Mario Kart, even Mario Kart 64 artwork with more than solely nostalgic malaise! I've written a review for CC2K, which should be going up this week. Although, I've also uploaded it to my blog, if anyone's interested! Fast paced frantic arcade fun. When I first played it I thought 'WOW' but I just can't justify the graphics looking shoddy. When I played I definitely thought the game was "well made and highly polished" but not that the "graphics look shoddy". Other than that NICE review. I love this game so much, I give this game 9.5/10 just because it's so easy to get from 1st to 12th place. but everything else is great, the controls, the graphics, gameplay, characters, and the tracks, and online, if you have a wii you should have this game. You won't regret it. So go get it, now. Edit: My mind has changed on this game. It's good but it does fall short in some areas. I don't know how you got bland graphics from this...everywhere you look there is something to look at, Goombas wondering around. Very odd. And about that having to use a controller as opposed to a Wiiwheel when racing online comment...you're joking, right? I'm high ranked, and I haven't used a controller with this game once. When my buddies come over we have a big game night, and they've never been able to beat me with a controller, only when they use the Wiiwheel do they have a chance. Using one of the optional wired gamepads does NOT provide a few extra second of accurate driving, that's false. It's the skill of the player using the Wiiwheel that comes into consideration. Other than that, decent review. I never noticed any bad graphics, either I just don't care as long as it doesn't look like MK64 or they're actually good. Definetly better than DD, anyway. But yeah, I don't like some items like POW and blue shell, but I thought that thundercloud and bullet bill were great additions. The Wii Wheel feels great to use, I never tried the GC controller but I imagine it would feel the same as it did in DD. And where did special items go!?! There are really only three characters, each with eight variations that look a bit different. EDIT: I didn't know at the time that the characters did have differences. Sorry! Still, I'm having a great time with this game. Although this game won't make me throw out double dash as Brawl did with Melee, it's still somehow super-fun. This is the first Mario Kart game that my mother has played. And she's still playing it every day! I have not yet tried Double Dash!! or DS. But this one remains the true one in the series by far. The visuals are clean (with a lead), the characters and the online is polished and the new (and retro) courses are simply excellent. If you don't own this, get it. But be warned----there will be many hits and blue shells! Great game, but trembles in the pure awesomeness of mario kart double dash! Online is amazingly fast when it comes to finding people. The game is great. I just hate how every second you're hit with one attack after another. It frustrates me. I think you may have been abit overly harsh on the Graphics, ok so its not Gran Tursimo PS3 style graphics but it was never intended to be. Other than that good review. My prefered method of control is with the Wii Remote and Nun-chuck. I find that the wires just arent long enough on the Gamecube controllers so means I end up sitting closer than i'd like to the TV. What an odd review. Six uses of "sad" or "sadly," and yet the game happily scores a 9 out of 10. Best Racing game ever! It has fun driving tech with the use of the Wii wheel! The best vehicle I would use is a Medium Character's wild wing. Though what I hate is that no one can get first on the WFC because of those cheaters who get less a minute as a score... > But that doesn't ruin the fun of the game. So are you saying this is only Mario Kart game that has bikes? Not even Mario Kart 7 has bikes? Doesn't matter to me, cuz I can crush my family with the Wild Wing! Anyone wanna say their favorite kart or bike? But why does Mario always get the credit, why can't do a racing game where they put most of nintendo's franchises into one epic racing game like the legendary smash bros. series? I would love to race playing Samus and she drives on kart version of her ship. What is wrong with the graphics and presentation!? Yes I read the review... and no I don't understand. I think this is one of (especially back when it came out) the best looking Wii games out there. I disagree with the reviewer about the menu's after all the overly flashy menu's seen in many modern games I prefer the simple efficient menu's that allow you to get the job done quickly instead of having to wait for the menu to load. Games like DIRT have ridiculously over the top menu's I guess you could call that good presentation but I call that overkill because I didn't buy the game to look at the confusing menu's I bought it to play the game. Also Mario Kart looks great but the reviewers expectations are overblown because of his experiences on the HD consoles.